Spot the difference... 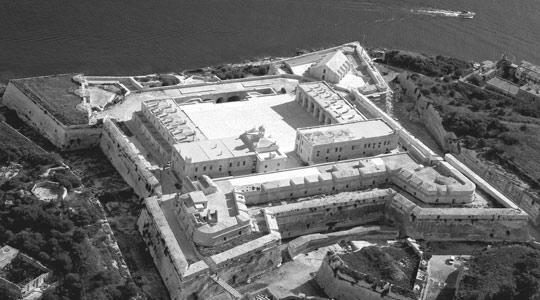 The historic Fort Manoel (Photo: airphoto.com.mt) contrasts sharply with Tigné Point. On the eve of a share issue, Midi chief executive officer BEN MUSCAT defends Tigné Point and speaks to Christian Peregin about the plans for the idyllic Manoel Island. Sitting at the boardroom table of the Midi offices nestled on Manoel Island, Ben Muscat is flanked by two wooden windows. 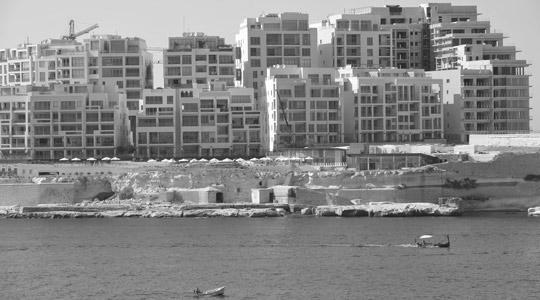 On his left is a view of the Sliema Ferries: a series of towering blocks of haphazardly-designed apartments. And the window on his right frames Tigné Point, a planned village which constitutes one part of the €600-million Midi project that will reach completion in 2018. You would think the man who steers such a massive project would not bother reading what people have to say about it on online comment boards. But he does. In fact, he gives the impression that he takes them very much to heart. Soon after giving a short introduction about the status of the project, he quickly quotes “critics” describing Tigné Point as “a stack of boxes” or “rabbit warrens” where you can practically “shake hands with your neighbours from your balcony”. “I think people saying these things should ask those who are putting their money where their homes are,” he says of the affluent people who seized the apartments put on the market so far, despite being among the highest priced in Malta. Though self-assured, Mr Muscat says he is keen on listening to “objective criticism”. But he also believes that a lot of negativity about the project stems from envy or from a, perhaps justified, aversion to developers, no matter what they do. And how does he respond to the critics? “At least it stands out from everything else there,” he says. From the strategic standpoint of his boardroom table, he points out the difference between Tigné Point and the rest of Sliema from the windows behind him, which seem to have been built precisely for this purpose. That such a planned and expensive architectural project stands out is a given. But is this the yardstick one should use to measure this type of development, and if so, does it stand out nearly enough? Taken aback by such a seemingly disingenuous comment, I ask him whether he honestly feels that Tigné Point is not an architectural gem. He also mentions the condemnation of the Maltese towards world-famous architect Renzo Piano – particularly the criticism which foiled his first plans forValletta. “We lost 20 years of Renzo Piano,” Mr Muscat laments. “I’ve never said this is the type of architecture that everybody will like,” he says more specifically, adding that many people have the wrong idea about architecture: that it should be uniform and tidy. Despite his obvious disagreement with such a suggestion, Mr Muscat paints a picture where Tigné Point is as much a reaction to Sliema as it is a reflection of it. It provides a tranquil environment where children can ride their bikes without worrying about oncoming cars and where people can walk freely, do some shopping and sit down for a bite to eat, away from pollution or traffic. But at the same time, it would have been “silly” to ignore the Sliema cityscape and build bungalows and villas in the area, he says. The Tigné Point project is expected to be fully concluded by 2014 and although it is already bustling with activity, Tigné North has yet to be built, including two more blocks of apartments, a business centre and Tigné tower. Mr Muscat points out that the development brief for the project was outlined in 1992, meaning things have changed over the past 18 years. In fact, Tigné tower was originally conceived as a hotel, back when this was probably still a good idea. But the hotel business is pretty saturated around the area now, so Midi is weighing up its options with the planning authority. It hopes to retain a hospitality element while coming up with something more commercially in demand – perhaps a block of fully-serviced luxury apartments which can be rented out to tourists. This is not the only thing that would have changed from the original plans. When Midi first took on the project, Sliema had certain height restrictions which were later relaxed. Midi capitalised on this and added more storeys to some blocks. However, Mr Muscat sees this as something positive, because it allowed them to use a smaller footprint of the area for residential space, and made it possible to have more space between buildings, including two large squares. He says the architecture is cutting-edge and some aspects are ahead of their time, such as the terraced building which maximises shade, light and energy and in effect makes it impossible for one to shake hands with one’s neighbour, as commonly claimed. But if he is so convinced that this project is exactly what it should be, why did he feel the need to tell the press that part two of Midi’s project (Manoel Island) “will be no concrete jungle”? Was that not an admission of guilt about Tigné? Mr Muscat thinks “concrete jungle” is a facile term because all buildings are made of concrete. “The only thing like this is Mdina,” he says, again focusing on the lifestyle one can enjoy ina space that is pedestrianised, sheltered and secure. The fact that Tigné Point was planned shows that unlike the rest of Sliema, the planners could allocate specific areas for open spaces. On the other hand, Sliema has towers of apartments next to one another, with greenery and open spaces being not even an after-thought. The only “cure” at this point, he says, would be for a “madman” to decide to demolish everything and rebuild it all from scratch. He also denies that Tigné Point somehow ruined the view of Sliema from Valletta, arguing that things change with time and there was little value in holding on to a derelict peninsula. But for all his enthusiasm and defensiveness about Tigné Point, Mr Muscat is well-aware that the real gem of the Midi projectwill be Manoel Island – anidyllic Mediterranean marina village which will also be pedestrianised but, unlike Tigné, willbe surrounded by a mini-forest, and will be made up of low-rise buildings. He says this will be a “totally different offer” from Tigné Point, because it is an island, not an extension of Sliema – and because the development brief stipulates low-rise development. Mr Muscat points out it is also in Midi’s interest to ensure that the area remains mostly unspoiled and the residential units are low-rise, because this adds value to the project and makes it distinct. “Nothing will be higher than four floors, except for one building which may have five storeys. Most of the buildings will not be higher than three floors,” he says. He finds it difficult to categorise the residential units as apartments because many of them will be designed vertically, meaning that a three-storey unit can consist of two homes, each having a part of the ground floor and a part of the roof, and are intertwined to maximise other comforts. “This is not the place for a million-dollar view,” he says, adding that nothing can beat the view from some of the apartments on Tigné Point. Instead, the selling point of this development will be its unique atmosphere. If some of the preliminary plans are taken on board, a resident of Manoel Island can berth a yacht in the marina and ride on a dinghy to his or her seafront home, disembarking right outside the living room. The island, which already comes complete with a nowrenovated fort, will also haveits own piazzas, casino, restaurants, mini-forest, shops and underground parking. 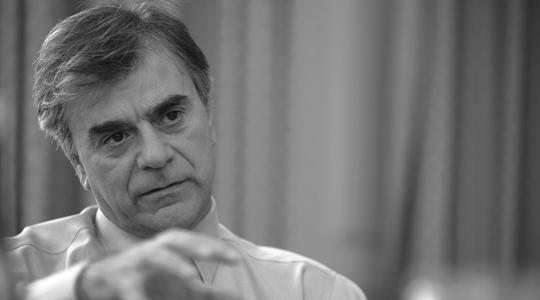 When pressed, he says the company is projecting the price of a property on Manoel Island to be similar to that of the most expensive apartments on Tigne Point – those with a full Valletta-facing view – which cost more than €1 million. In fact, property in Manoel Island will only be put on the market after all the properties in Tigné Point are sold, to prevent the company from competing against itself on the real estate market. Asked if he feels the market is saturated, he says the two developments are “completely different”, even though he does not exclude that people who currently live in Tigné Point may eventually choose to move to Manoel Island, or retain their original property and buy another one. Midi can build around 460 apartments, including 55 duplex residential units, on Manoel Island, meaning the population will be of less than 2,000. The consortium is also considering lightening the density as much as possible, potentially reducing the number of apartments. But Mr Muscat has no intention of duping anyone into believing this decision is an environmentally moral one. Referring to “us greedy developers”, he explains that reducing the number of properties would make them more exclusive, and therefore more expensive. Mr Muscat enjoys speaking about Lazzaretto, one of the areas on Manoel Island which was a quarantine hospital built in the 1600s. In fact, many famous personalities passed through this hospital throughout history, including world-famous poet Lord Byron who even left some of his graffiti on the walls. Midi is contractually bound to restore all heritage sites at Tigné Point and Manoel Island to the tune of €30 million, but Mr Muscat is keen to remind that such sites require constant maintenance and will not be sustainable unless they are given a commercial use. One of the ideas, in fact, is to turn Fort Manoel into a boutique hotel with 55 suites. This could also include a museum recounting the history and importance of Manoel Island. Its parade ground can then also be used for weddings or large concerts, he adds. However, these ideas are all in their preliminary stages. In fact, Midi was also approached by an American University interested in establishing a base in the Mediterranean and using Fort Manoel as a research centre. Midi has a 99-year lease on all the land it is developing, and everything will then be transferred to the government. He lists a series of aspects of the project which will, or have already been given to the public, including walkways and renovated historical sites. Mr Muscat’s fear is that without commercial uses, the island could easily degenerate again and fall victim to vandalism as it has throughout the years. Since Manoel Island needed to remain scarcely developed, he says it could only make sense for investors if the project could be combined with a more “intense” real estate project such as the one in Tigné. So what does Mr Muscat think of the Malta Environment and Planning Authority? Is it as draconian as some architects would have us believe? And after the Midi experience, what advice can Mr Muscat give the government regardingnegotiations on public land, such as that of White Rocks? “My advice would be for whatever government is giving up, it should get back as much as possible for the public. It’s a formula that works. Another good trick would be to oblige the developer to deliver a chunk of infrastructure early on,” he says. Tomorrow, the public is being given a chance to buy new shares in the project with the potential of owning up to 28 per cent of the company. But if it is such a good investment, why shouldn’t the current shareholders buy the shares themselves? He says most large projects around the world work in this way, and it is likely that in some four years’ time, another scheme would be announced to increase equity again. Mr Muscat is fairly confident that the shares will be oversubscribed in what is the businessman’s equivalent of an election day. Like a politician, Mr Muscat knows he is tipped to win. But a niggling feeling of self-doubt remains and until he is declared winner he clings to the hope that what has been built so far speaks for itself. As he closes the windows of his emptying boardroom, he looks at Tigne Point and wonders why some people do not see what he sees.